The parietotemporal/parietomastoid suture posteriorly signifies the articulation among the parietal as well as temporal bones. They anteriorly merge at the squamosal suture. The parietotemporal suture is said to be the most posterior extension of squamosal suture and is occasionally intruded from the squamomastoid fissure. 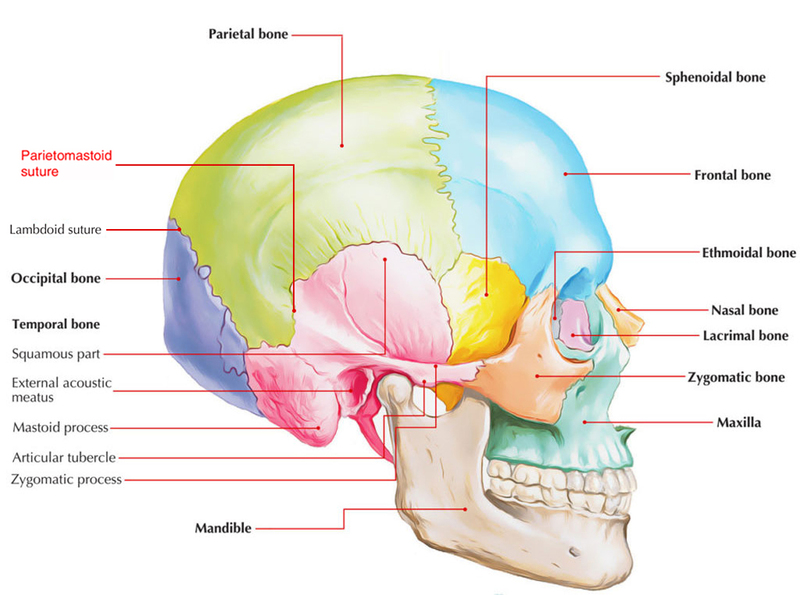 Both temporal bones and the occipital bones merge posteriorly via the occipitomastoid sutures. Superiorly: Right temporal bone articulates with the right parietal via the squamosal suture. Posteroinferiorly: Via the parietomastoid suture. Anterolaterally: Right zygomatic via the zygomaticotemporal suture. Anteriorly: Right greater wing of the sphenoid via the sphenotemporal suture. Superiorly: Left temporal bone articulates with the left parietal via the squamosal suture. Anterolaterally: Left zygomatic via the zygomaticotemporal suture. Anteriorly: Left greater wing of the sphenoid via the sphenotemporal suture.